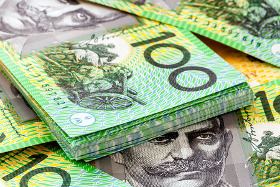 The Australian dollar rallied today against most-traded peers thanks to the inflation print that came out slightly above expectations. The Australian Bureau of Statistics reported that the Consumer Price Index rose 0.5% in the December quarter of 2018 from the previous three months. Analysts had expected the same 0.4% rate of growth as in the September quarter. Year-on-year, the CPI rose 1.8%. The trimmed mean CPI rose 0.4% last quarter — in line with expectations. Released yesterday by National Australia Bank, the business confidence index was unchanged at +3 in December. At the same time, the business conditions index dropped sharply from +11 to just +2, demonstrating the biggest drop since the global financial crisis. AUD/USD rallied from 0.7154 to 0.7193 as of 17:19 GMT today. EUR/AUD declined from 1.5973 to 1.5866. AUD/JPY climbed from 78.26 to 78.82.